There’s something special about truffles. They are undoubtedly the easiest chocolates to make but, like boiling an egg, or making the perfect piece of toast, perfecting a lovely shiny, creamy, and delectable ganache is an exercise in balance and patience, the ratio of chocolate to cream, the quantity of butter, and a little wrist action. I promised I’d make proper truffles and so I have. 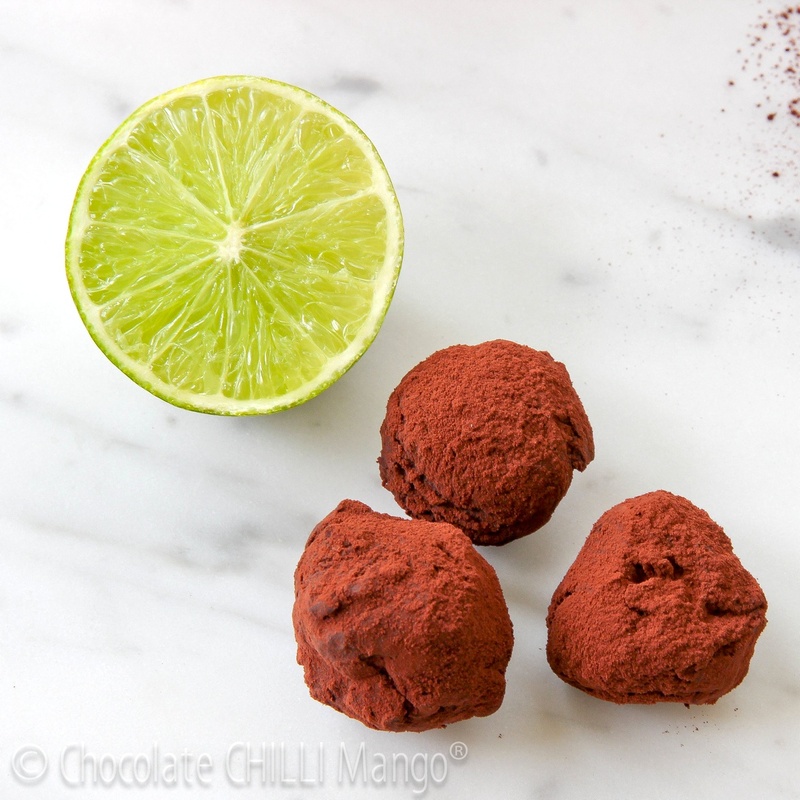 Citrus cocktail flavoured truffles … lime and white rum to be exact. Badass enough for you? You’re probably wondering why I didn’t make mango truffles. 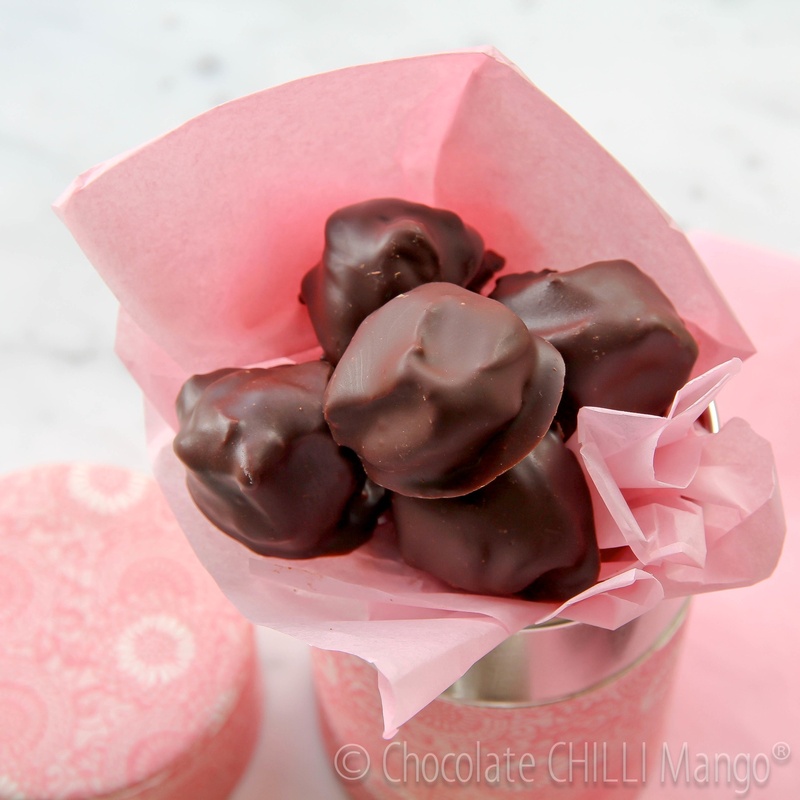 Or chilli truffles. 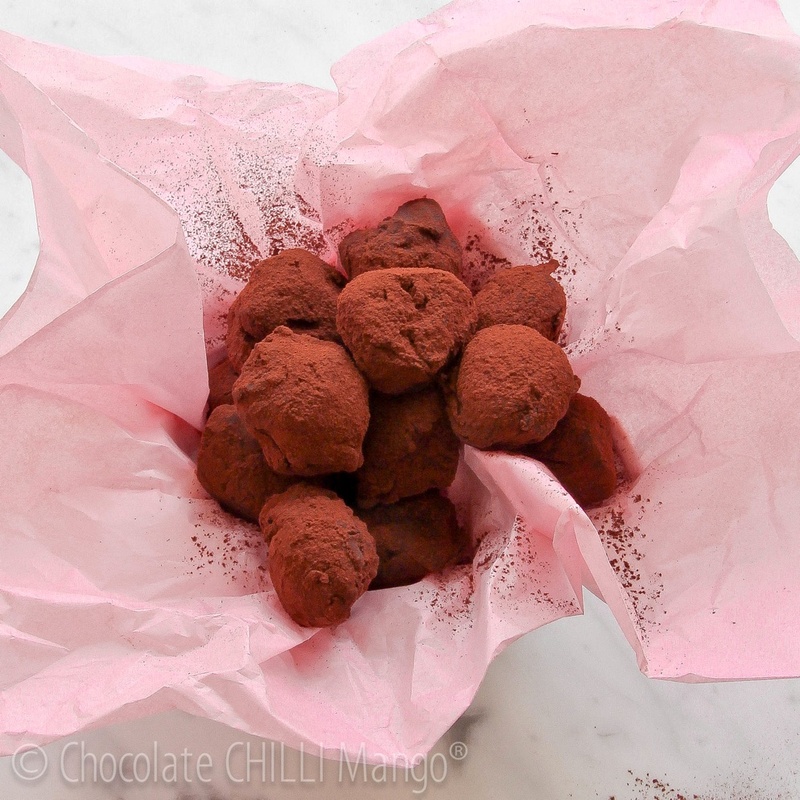 Or chocolate chilli mango truffles. I have. I will. But not today. Too obvious. Predictable. These are just a sprig of mint away from being mojito truffles. 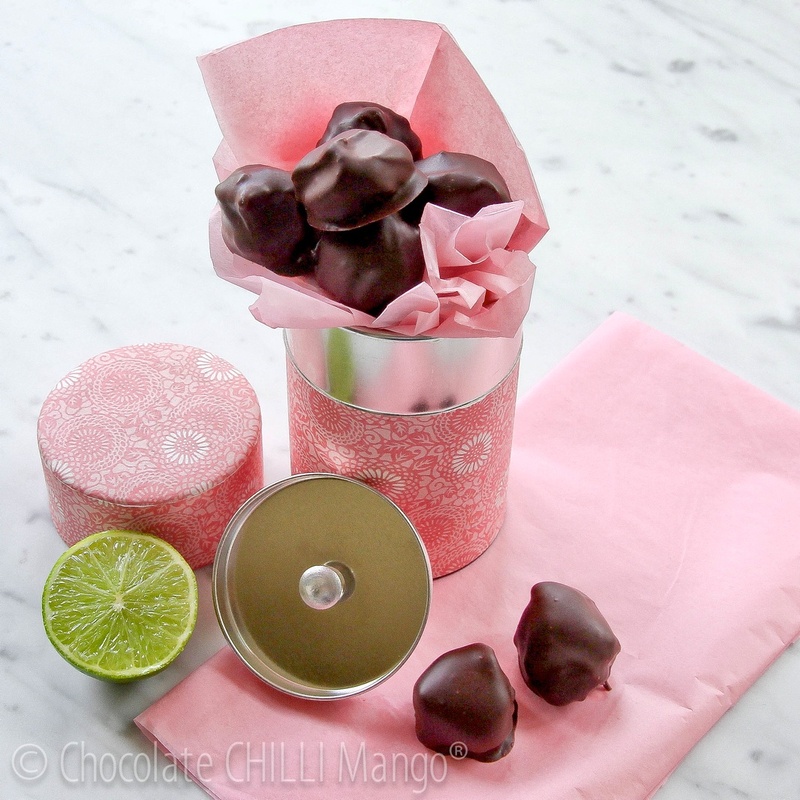 Adding mint to chocolate is lovely but would overpower the lime in these creamy centres and I want the lime to feature. I love all citrus fruits with chocolate but lime and yuzu are my favourites. Lime has a special astringent tang that I love with the bitterness of dark chocolate. But that said, while I’m generally NOT a fan of white chocolate, lime and white chocolate are magic together too. White chocolate is too sweet for me but the citrus acidity cuts through it nicely. So what chocolate to use with the lime? Well, you can use whatever takes your fancy. I considered using a Valrhona Manjari as it’s got an astringent bite to it, but I went with a Valrhona Araguani instead. It’s dark and intense but with a nutty smoothness that just screams suave Venezuelan. Yes, I get a little carried away by chocolate. More than a little. A lot. Short answer … a great match and contrast for the sharpness of lime and rum. Note that the white rum is optional. The alcohol is purely in a support role here. The lime zest is the star attraction. The flavouring possibilities for truffles are endless of course and I give a few other citrusy variations below that I love, just to keep with the citrus theme. I’ve used fresh plain old garden variety limes. They are particularly good at the moment, with a fragrant and flavourful zest (and lots of juice inside). You could use kalamansi lime … very trendy, everyone raves about it. It’s lovely, but the zesty flavour of plain old lime is a thing of beauty too. I hope you enjoy them as much as I enjoyed making them. I literally almost burst into song as I worked. I’ve given two methods for preparing the truffles, below. Which one you choose to use depends on your preference, confidence and skill in working with chocolate. Tempering chocolate is not difficult, but even when you’ve had lots of practice, things can still go wrong, if the chocolate doesn’t crystallise correctly, and if it loses its “temper”. There are a lot of sites on the Internet that give great directions for tempering chocolate. If you do choose to use the method I prefer (I’ve called it the Purist’s Method), the ganache will remain fairly soft and creamy when set. This gives you that luscious creamy truffle centre we all adore. Plus, you can store the truffles airtight, in a cool dry place and they will keep fresh for at least 2 weeks, without the need for refrigeration. If you use this method, do not be tempted to place the ganache or truffles in the fridge or freezer, even briefly. The humidity within the refrigerator and freezer will cause condensation and the truffles will spoil at room temperature, when stored. As soon as you decide to refrigerate or freeze them, you’ve chosen your path! There’s nothing wrong with using the Refrigerator Method, below, however, and you can still soften the truffles at room temperature before serving. I didn’t have room on the bench for my marble slab yesterday so I used the seeding method to temper the chocolate for enrobing. You will need a candy thermometer. Melt two thirds of the chocolate in a heatproof bowl over hot water, until smooth and it reaches no more than 45C. Alternatively, melt the chocolate in a microwave. Microwave it for 1 minute and then stir it. Subsequent microwave zaps should be no more than 20-30 seconds. Melt only until 45C. Remove from the heat and add the remaining one-third of the chocolate and stir it with a spatula until melted. Continue stirring and check the temperature. You want the crystals to be small and even so that the chocolate shell will be shiny and snap beautifully, revealing the creamy truffle centre. Don’t forget to scrape down any chocolate on the sides of the bowl. It will be ready when the chocolate is around 32℃ for dark couverture. A degree either side of this is OK. Keep moving the chocolate with a spatula during the enrobing process to make sure it does not begin to cool down too quickly and set around the edges. If your chocolate cools, place a heat pad underneath it or around the bowl to keep it warm or use a heat gun on gentle heat for a few seconds to warm it up gently. Stir it when you warm it. 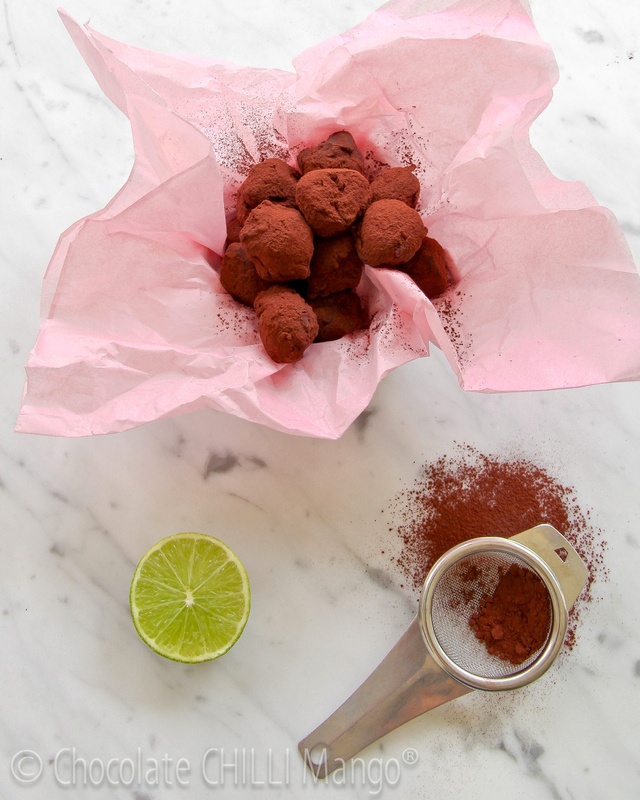 These truffles also work really well with white or milk chocolate. * If you wish to enrobe only half the truffles in tempered chocolate, as I did, use the smaller amount of chocolate indicated here. Chop the couverture into small even pieces and place in a large heatproof bowl. Heat the cream and lime zest together in a saucepan until it comes to the boil. If adding honey to sweeten, add it to the cream and zest before placing on the heat. Remove from the heat and gently pour the cream mixture over the chocolate. Let sit for 20 seconds. With a whisk, gently start to stir the truffle mixture from the centre of the bowl. Continue whisking gently until all the chocolate melts, and the mixture is smooth. It should still be very warm. Add the butter and whisk until the ganache is super shiny and smooth. Add the rum to the ganache and whisk until smooth again. Let the ganache cool, then cover tightly with clingwrap. Line a large tray with non-stick silicone or parchment paper. When the ganache is cool, cover tightly with clingwrap and set aside in a very cool, dry spot. I usually leave it on a stand in the hallway, which is one of the coolest spots in the house. Leave it until the ganache thickens and sets. You can leave it overnight, if you wish. When set, the ganache will still be soft. If coating in cacao powder, have ready a plate or bowl with some sifted cacao. If you wish to enrobe half or all the truffles in chocolate, you will need to temper the chocolate first. When the ganache is cool, cover tightly with clingwrap and place in the refrigerator to set. When set, the ganache will be firm enough to roll into balls in the palm of your hand. Dust your hands with cacao to help prevent the ganache from sticking. Use a teaspoon to scoop out a small amount and roll each into a ball. If you are coating the truffles in cacao powder, have ready a bowl or plate with some cacao and toss each one in the cacao before placing on a tray lined with silicone paper. When finished, you can store the truffles in an airtight container in the refrigerator. I like to place the truffles in even layers with a sheet of parchment between each layer. If coating some, or all, of the truffles in chocolate, you can choose whether to temper the chocolate first. As you will be storing them in the refrigerator, it really doesn’t matter, so it’s up to you. Temper the chocolate or melt it in a heatproof bowl over hot water until smooth. Dip each truffle into the melted chocolate and place on the lined tray. When the truffles have been coated in chocolate, you can set the tray in the refrigerator to set. When set, store the truffles in an airtight container in the refrigerator. To serve, you can either serve them straight from the fridge (good in summer, I guess) or leave out for 30 minutes to allow the ganache to come to room temperature before serving. They will be a little softer and more creamy.